Should you decide that today is the day for you to pull the trigger on a custom designed Moto X through MotoMaker, Motorola will reward you with a free pair of SOL Republic Jax headphones. These in-ear headphones retail for $39.95, plus Motorola is still including free Skips with all orders ($20 value), so you are looking at freebies worth up to $60. The deal is apparently only good for today. 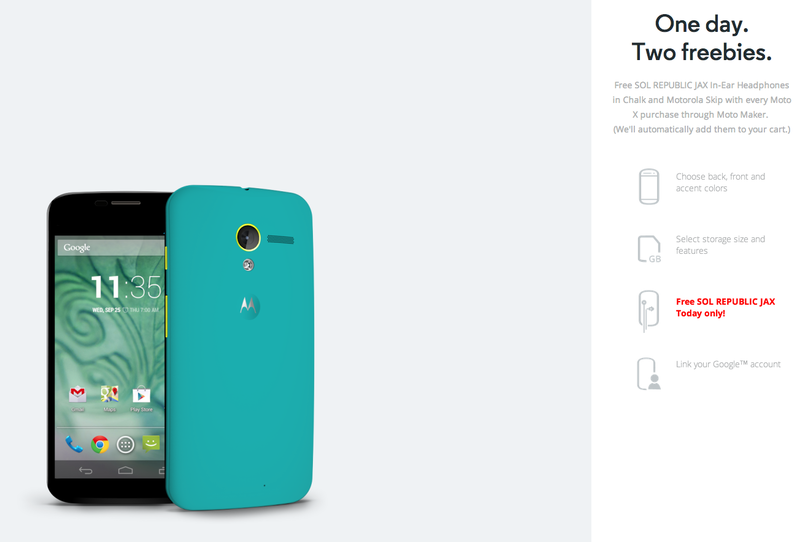 Now, normally Motorola lets you choose the color of the Jax headphones to match your design, but it looks like for the promotion they are tossing in a free pair of the “chalk” color. In other words, you are getting a free white pair of headphones, not the matching pair of your choice. If you are still on the fence about this phone, be sure to check out our Moto X review and then read up on the latest camera improvement update.